thezodiackiller.digitalzones.com > Topics > The FBI FOIA and the JT clues. If you go to the FBI FOIA Zodiac killer files especially volume 5 of 6 pages 209 and 226 you'll see what I mean. There are very few actual Zodiac killer documents posted there however the ones that are there definitely show the J-hook nuances, it's like someone at the FBI knew those clues were pertinent but made no comment as to that fact. As a matter of fact; in the writings they have posted, there the J-hooked nuances are very prevalent. Note the 'time/date' stamp, note the deliberately open letters, then read the document phonetically: "Here I tis Ja Turince" also "Black Jolly of anger". Notice the way he deliberately formed the 't' in the word 'at', it's also a compound JT initial clue. This deliberate nuance is found on all of the crimes that I suspect he was involved in. 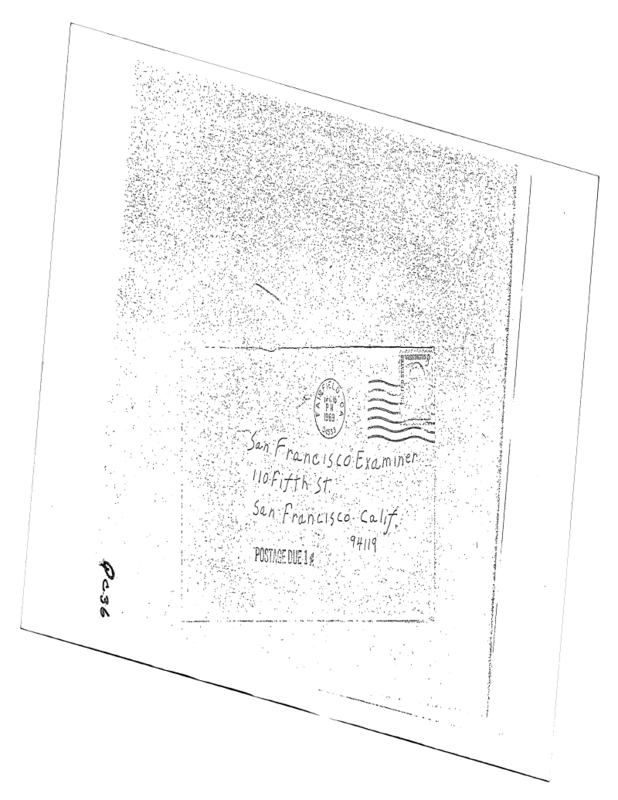 These are some of the key documents from the FBI's FOIA Zodiac killer file. Note that they also noted the J-hook nuances, notice also all of the compound or combination JT initial clues. The 'Dear Draftboard' letters show a firm link to Zodiac and the OCCK case. Apparently someone at the bureau noted the 'rabbit' clues. I'll post the rest of the 'Dear Draftboard letters within the next day or two. There's no explanation in the Zodiac FOIA files as to what they've found or why they included the 'Dear Draftboard' documents. Was it because they figured out that all of the Zodiac killer postcards had a 'Jack' clue in common? I think that that's part of it. It's interesting to see that they've focused on the same things that I've been saying that the key documents share. This is from the Suzanne Degnan murder/dismemberment/phoney kidknapping case, notice how 'fanciful' and deliberate the structure of it is. The 't' in waite (sic) acts as an early JT initial clue. He adopted 'compound' or combination JT initial clues later on. He literally saturated the phoney Ramsey ransom note with his initial clues. He intentionally left a trail to be "follow....ed" (one of his favorite keywords). You can tell by this last document that he liked to switch things up, like with the four differently constructed letter 'f's. I point out that "FLO" is the only letter combination that repeats four times. 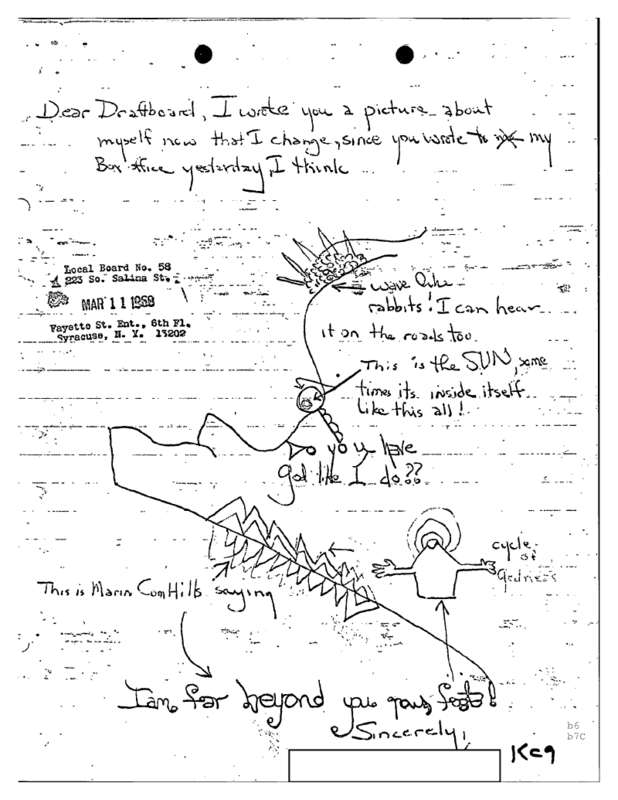 Why the FBI included the Dear Draftboard letters in the Zodiac killer files is still something that I don't know? It is interesting, to say the least. It tells me that they knew far more than they were saying. Where did they get them from? Notice all of the same nuances occur on these documents. JT was leaving a very discernible trail of clues. J-hooked S's were one of his favorite devices. Crowding or compression and expansion are another repeating device. Spacing between and within words were another device, as were the deliberately misspelled words, mixed in documents with much more commonly misspelled words. Notice that for instance: how he structured the 'k' in York. Also, long stemmed J's are another device that he favored. He also liked to manipulate the relative size of different letters. This is from the Chicago Lipstick murder spree. Notice how a Zodiac theme of this guys mind is emerging. Notice the Zodiac cross-hairs symbol on the earlobe. This is related to the 1976/77 OCCK case. Said to be a drawing of victim Mark Stebbins, found taped to the wall at the 1978 death scene of Chris Busch. A suspicious suicide similar to the Michael Helgoth suspicious suicide scene as he might relate to the brutal murder of JonBenet' Ramsey.